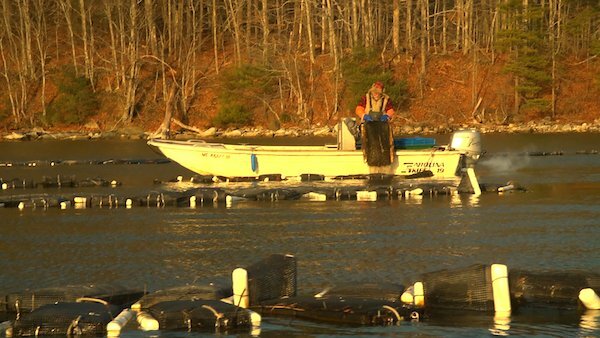 Visit the Pemaquid Oyster Company’s farm on the Damariscotta River, narrated by expert oyster farmers from Pemaquid Oyster Co. on board. Bring your questions about marvelous Maine oysters on this special hourly tour! Tickets are only sold online for the first tour. The rest is cash or check at the gate. Thank you for your understanding. Damariscotta, ME – The River Tripper will be making special, one-hour tours to Pemaquid Oyster Company’s farm starting at 11:00am, in support of the Pemaquid Oyster Festival. This year’s docents onboard will be from Pemaquid Oyster Co., ready to answer all your questions about the celebrated shellfish; and as always, a full cash bar will be available. The boat trips will leave every hour beginning at 11:00AM and ending with a 4:00PM departure. Fares for the cruises will be $15 for adults and $10 for children under the age of 12, payable in cash or check. Portion of the proceeds from these tours will be donated to the Edward A. Myers Marine Conservation Fund, named after the ‘grandfather’ of oyster farmers’ on the Damariscotta River. You will have fun learning all that you ever wanted to know about Damariscotta River oysters from the oyster farmers who work them every day. The very first tour at 11:00AM will leave from Damariscotta’s Town Dock (by the Municipal Parking Lot where all the little boats are). For this first tour only, Damariscotta River Cruises will take reservations over the phone (207-315-5544). Please be at the town dock by 10:30AM to ensure your seats. This tour will return to the Schooner Landing Restaurant and Marina, from which all subsequent tours will depart. All passengers will debark within the festival area, with no need to stand in line for entry. For the four afternoon sailings we will sell tickets at the gate of Schooner Landing Restaurant and Marina (between the two white tents) on a ‘first come, first served’ basis. Passengers will receive a boat ticket with payment (sorry, no credit cards), so that they may leave and return to the festival without standing in line again. Remember to bring your questions about marvelous Maine oysters!